On May 8, 1980, the World Health Organization announced that smallpox has been eradicated worldwide. Caption: From an earlier period in the history of smallpox, Vaccinating the poor is the title of this 1873 color print from a wood engraving by Sol Eytinge, Jr. (1833-1905). It originally appeared in Harper’s Weekly magazine, March 16, 1872. 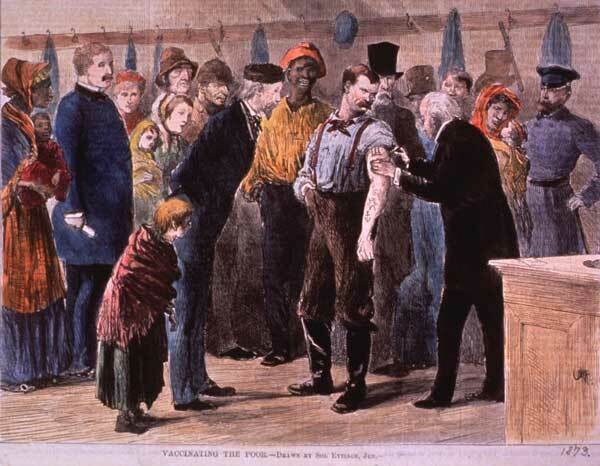 In this crowded room, men, women and children, black and white, observe a physician as he vaccinates the tattooed left arm of a burly young man. Finding the Comedy in Cow Pox?